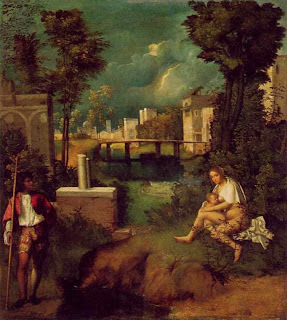 In my interpretation of Giorgione's Tempest I argued that the famous painting has a "sacred subject," "The Rest on the Flight into Egypt." Since my initial discovery back in 2005, subsequent reading has led me to see that an increasing number of scholars are coming to understand the role that religion played in the life and art of Renaissance Venetians. Nevertheless, it is still hard to overcome the view that has prevailed for centuries that the Renaissance turned its back on Christianity in favor of the world of pagan Greece and Rome. For example, scholars sometimes point to the passage in the will of Gabriele Vendramin, the owner of the Tempest, where he directed that his collection not be dispersed or sold upon his death. He said that the collection had given him great consolation in moments of quiet contemplation. Scholars assume that he was contemplating the works of antiquity but the paintings in his collection were mainly "sacred" or devotional subjects. 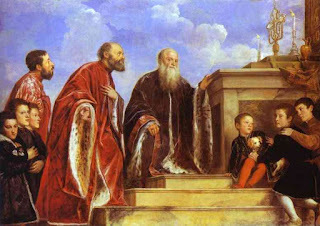 [Notice Titian: "Gabriele Vendramin with Brother and Nephews Venerating a Relic of the True Cross"] Indeed, the great majority of paintings found in the homes of Venetian patricians were of sacred subjects, including many versions of the "Rest on the Flight into Egypt." In our modern world it takes a great amount of "historical imaginaton" to see things as Renaissance Venetians saw them. Below find selections from two great scholars on the need for “historical imagination” for a correct understanding of the past. The first is from Piety and Patronage in Renaissance Venice, by the late Rona Goffen. Her small book is one of the best monographs ever written about the Venetian Renaissance. Referring to the importance of the sermons of Bernardino of Siena, and Lorenzo Giustiniani, the saintly first Patriarch of Venice, she wrote of the need for an historically informed imagination. The second selection on the need for historical imagination comes from C.S. Lewis, whose greatness as a scholar is somewhat obscured today by the extraordinary success of his popular Narnia stories. Nevertheless, he was one of the greatest twentieth century students of Medieval and Renaissance literature. The following excerpt is taken from his small but brilliant study of Milton’s "Paradise Lost." In chapter IX of A Preface to Paradise Lost, Lewis discussed the need to see things through Milton’s eyes. "Our whole study of the poem will then become a battle between us and the author in which we are trying to twist his work into a shape he never gave it, to make him use the loud pedal where he really used the soft, to force into false prominence what he took in his stride, and to slur over what he actually threw into bold relief. The older modern reading of Dante, with its disproportionate emphasis on the Inferno, and, within the Inferno, on the episode of Paolo and Francesca, is an example of this…." "Fortunately there is a better way. Instead of stripping the knight of his armour, you can try to put his armour on yourself; instead of seeing how the courtier would look without his lace, you can try to see how you would feel with his lace; that is, with his honour, his wit, his royalism, and his gallantries out of the Grand Cyrus. I had much rather know what I should feel like if I adopted the beliefs of Lucretius, than how Lucretius would have felt if he had never entertained them. The possible Lucretius in myself interests me more than the possible C.S. Lewis in Lucretius…." "You must, so far as in you lies, become an Achaean chief while reading Homer, a medieval knight while reading Malory, and an eighteenth century Londoner while reading Johnson. Only thus will you be able to judge the work ‘in the same spirit that its author writ’ and to avoid chimerical criticism…." "We must therefore turn a deaf ear to Professor Saurat when he invites us ‘to study what there is of lasting originality in Milton’s thought and especially to disentangle from theological rubbish the permanent and human interest.’…Our plan must be very different—to plunge right into the ‘rubbish’, to see the world as if we believed it, and then, while we still hold that position in our imagination, to see what sort of poem results…." "I myself am a Christian, and that some (by no means all) of the things which the atheist reader must ‘try to feel as if he believed’ I actually, in cold prose, do believe. But for the student of Milton my Christianity is an advantage. What would you not give to have a real, live Epicurean at your elbow while reading Lucretius?" Let me just add a personal footnote. A few years ago I attended a Giorgione symposium at Princeton on a cold Saturday in December. Next day, my wife and I got up early to go to Mass at the Catholic church just across the street from the campus. It was December 12, the feast day of Our Lady of Guadalupe, but still we were surprised to find a good sized congregation in attendance at the 7:00 a.m. Mass. Even more surprising was the display that filled one of the two side altars. There was an image of Our Lady of Guadalupe along with an incredible array of flowers that even included a colorful working fountain. Catholic churches are usually somewhat bare during the season of Advent. Before beginning Mass the presiding priest, obviously Mexican, was on fire as he told the congregation of the story of Juan Diego and the miraculous appearance of Mary at Guadalupe almost 500 years ago. Most surprising was his announcement that 3 hours earlier, at 4:00 a.m., the church had been packed with over 600 worshippers gathered for prayers on the morning of this great feast. Afterwards, we discovered that there was a substantial community of Latino workers in Princeton. I relate this story because it occurred to me that even the greatest and wealthiest of Renaissance Venetian patricians would have been closer in spirit to these 600 Latino worshippers than he would have been to the 100 or so learned art historians who had attended the Princeton symposium. To put it another way it would take a great deal of imagination for an ordinary American to understand the mentality that could get up at 4:00 a.m. on a dark, rainy, morning to go to church and fill it with beautiful flowers in honor of the Madonna. 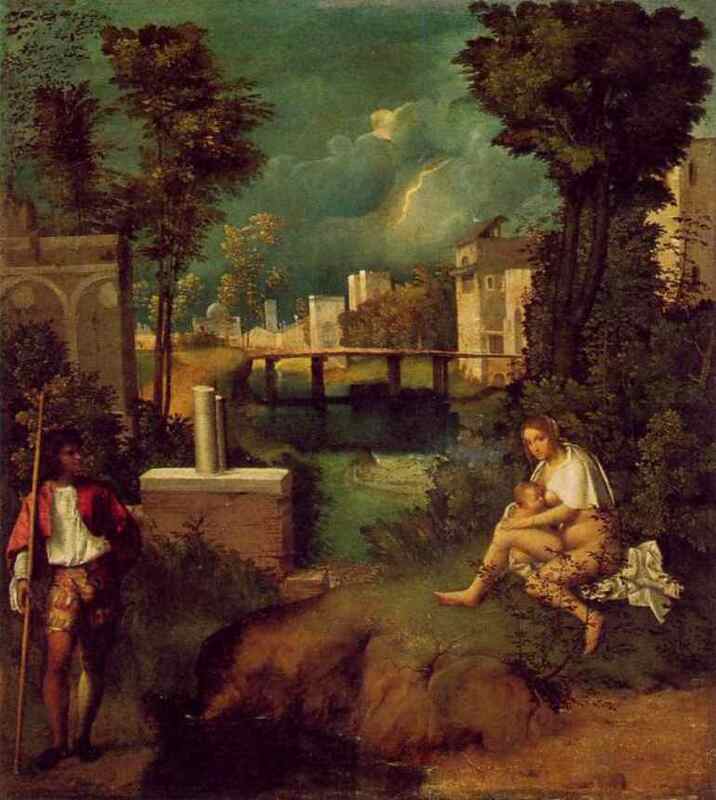 In a dozen years of lecturing on Giorgione's famous painting I have found that ordinary Catholics have no difficulty in seeing the Madonna nursing her child in the Tempest. 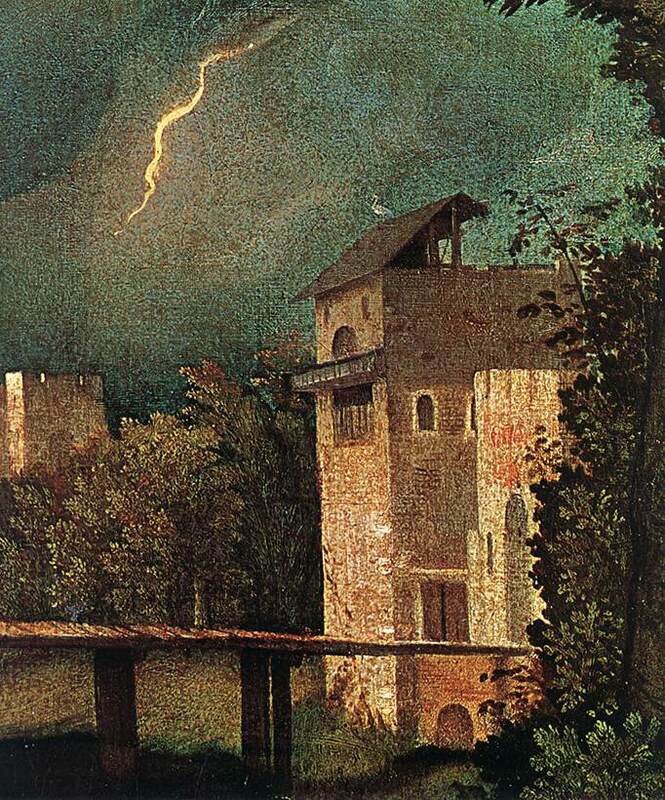 In my paper on Giorgione’s Tempest I looked at all the iconographical elements in the famous painting and tried to not only identify them correctly but also to put them together in a coherent whole. I understood that no piece could be left out of the puzzle or forced into place. Here I repeat a post that originally appeared on February 7, 2013 about the storm in the background, the last piece of the puzzle. Years ago I was an avid fan of jigsaw puzzles, especially landscapes. My method was to put all the end pieces together first as a kind of frame. Then, I would proceed to do the prominent figures in the foreground and put them in their appropriate spaces. Finally, the background landscape would be filled in with the usually blue sky saved for last. In the past few posts I have been going through the process of re-examining the pieces of the Tempest puzzle. 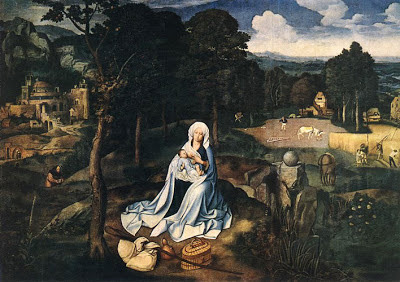 First, I discussed the broken columns in the mid-ground and showed that they were commonplace in depictions of the Rest of the Holy Family on the Flight into Egypt. In subsequent posts I elaborated on my discussion of the prominent figures in the foreground. In my paper I had claimed that the young man on the left holding a pilgrim’s staff is St. Joseph watching over the Madonna and Child, and in two posts I presented other contemporary examples of young, virile Josephs. I then discussed the nursing Woman and showed that the white cloth draped over her shoulders and the mysterious plant in front of her helped to identify her as the Madonna. Now, only the city and stormy sky in the background remain in order to complete the puzzle. In my paper I discussed both city and storm and I agreed with those who have seen that the city in the background could be Padua under siege in 1509 during the War of the League of Cambrai. Yet, Renaissance paintings are known for having many levels of meaning. The subject of the painting is the “Rest on the Flight into Egypt,” and so the city in the background must be Judea from where the Holy Family had fled after Joseph had been warned to flee the murderous designs of King Herod. The storm would then represent the Massacre of the Holy Innocents. In his great work on Medieval iconography, Emile Male discussed the liturgical importance of the Massacre. Many artists depicted the actual slaughter. Giotto and Duccio provided prominent early examples, and the subject was not uncommon in the Renaissance. Nineteenth century art maven Anna Jameson saw many depictions of the distasteful subject, on her many travels, but also noted that the Massacre could even be hinted at in versions of the Flight into Egypt. In my paper I argued that the storm clouds and lightning in the background of the Tempest can indicate the massacre of the Holy Innocents, a martyrdom that the Church had always regarded as intimately connected with the passion and death of Christ. I tried to show that storm clouds and lightning were not mere emblems but actual symbols of death and destruction. 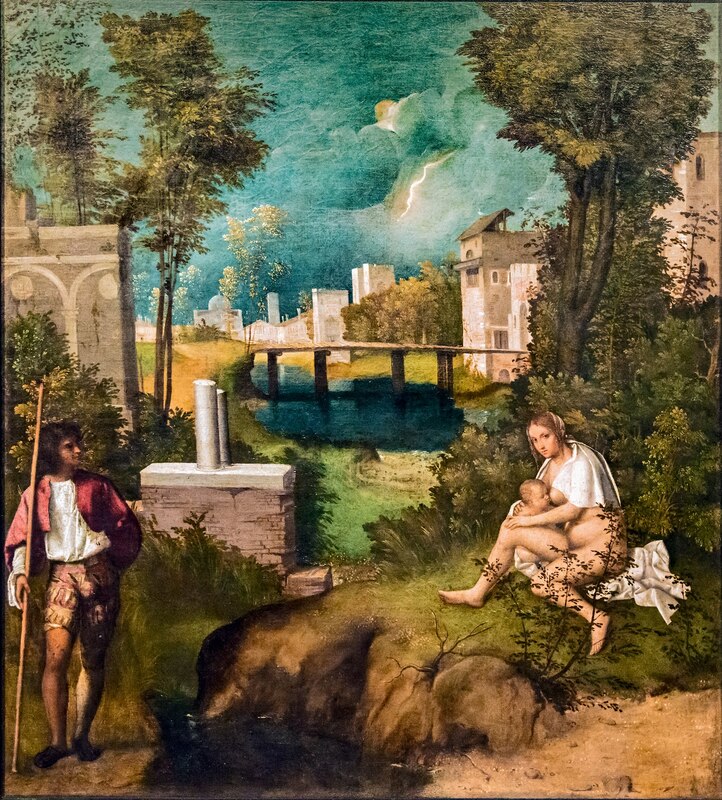 For example, Joachim Patenir, a Giorgione contemporary, darkened the sky above the city in the background of his depiction of the Rest on the flight into Egypt. Here is Carlo Ridolfi’s description of a storm in a lost painting describing a scene of death and destruction by the early Titian. A voice was heard in Ramah, sobbing and loudly lamenting: it was Rachel weeping for her children,…because they were no more. The solitary bird on the rooftop in the background of the “Tempest” has hardly been noticed or discussed in all the scholarly literature but it recalls the lamentation of Rachel.The source for the bird can be found in Psalm 102, one of the seven Penitential psalms. (Jerusalem Bible 102, v.7-8). There is a version of the “Rest on the Flight into Egypt” by Nicholas Poussin that now can be found in New York’s Metropolitan Museum of Art. It is actually a depiction of the encounter with the young John the Baptist on the return of the Holy Family from Egypt. The Museum notes that they are surrounded by many cherubs. It is true that those in the trees have little wings but the ones on the ground do not. These I believe to be the Holy Innocents. They all look to be the same age as the infant Christ. Edit: English Poussin scholar David Packwood has kindly supplied this information about the Poussin Rest. Storm clouds do appear in Poussin's paintings of the Flight into Egypt, usually clouds and cross in a symbolic cluster surrounded by cherubs, who represent the Holy Innocents. See NP's Dulwich Flight and Cleveland one. I covered the New York "Rest on the Flight" in my Phd. It's possible that ALL the children represent the Innocents. 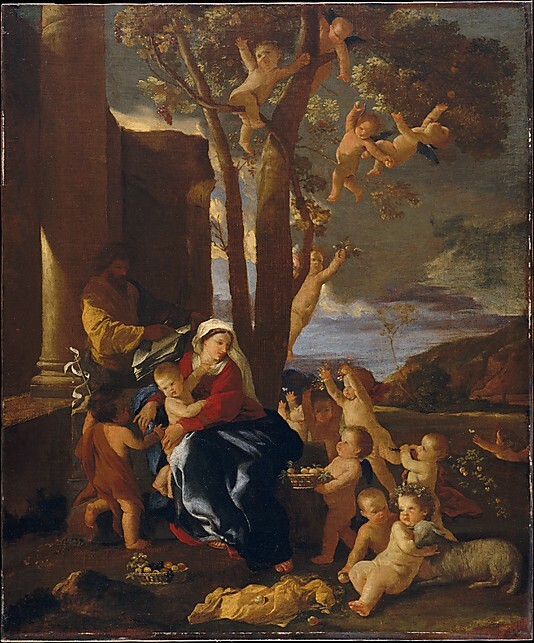 There's a putto high up on the tree who has his arms outstretched in an "orans" gesture- and I think Poussin might have been alluding to the cross here, The iconography is very complex in this picture. Did you see the butterflies? I think these are symbols of the infants' soul. Some scholars think that the lake behind the children could allude to baptism. Diana di Grazia wrote a long article about it for the Poussin Cleveland conference way back in the 90s.There's lots of stuff on the Innocents in that. It's also significant that the children are the same age of Christ in the New York picture. According to Counter-Reformation doctrine and debates on infant baptism, Christ was the saviour of infants. Finally, I think the NY picture has a Neapolitan provenance. 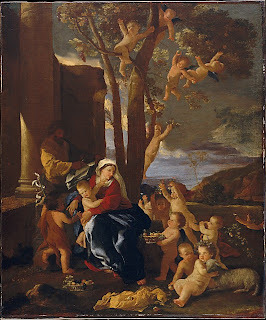 Significant because one of Poussin's patrons- the poet Marino- came from Naples and wrote a poem about the Massacre of the Innocents, which heavily influenced Poussin. *Emile Male: Religious Art in France, the Thirteenth Century, Princeton, 1858, p. 186. **Anna Jameson: Legends of the Madonna, Boston, 1885, p. 353. *** Carlo Ridolfi: the Life of Titian, Penn State, 1996, p. 75.